Ceramic microstructures enjoy covalent bonding inherent between non-metal elements. This means they share electrons. This atomic co-operation yields a very strong attraction force and because of this, ceramics offer a series of benefits in comparison to metals. They normally have a very high hardness (70-90 HRc) and elastic, or Young’s, modulus. This means they are resistant to shape change when loads are applied along with improved wear characteristics. Ceramic bearings can run lubrication free. This is because ceramic materials don’t micro-weld. Micro-welding happens, typically with metals, when the surface imperfections on the rolling element and raceway interact with one another causing an electric arc. This degrades the surface and substantially reduces the bearing life. Ceramic materials do not have this issue which makes them suitable for various applications which require a lube-free environment. They usually behave in a stable manner at high temperatures meaning there is less thermal expansion. It takes a great deal more energy to increase the bond length of a covalent bond in comparison to a metallic ionic bond. Ceramics are non-metallic, nonferrous materials. They don’t corrode in the same way as metals when exposed to water and other hazardous chemicals. Their high degree of corrosion resistance allows them to perform excellently in wet and chemically-corrosive environments. Many engineering ceramics also have a low density leading to improvements in bearings’ operational speeds, which is due to low centripetal forces and reduced friction. Due to the lack of free electrons in most ceramics, they are non-magnetic and excellent insulators. I know what you’re thinking: Look at all of those advantages! Why aren’t all bearings made of these brilliant materials? But I’m afraid I have a bit of potentially bad news. The first thing people might notice when researching ceramic bearings is that they are substantiallymore expensive than their metal counterparts. There are many reasons for this. There are extremely high energy and processing costs associated with the massive energy needed to reach the required temperature for the sintering process of high grade raw materials. Since ceramics are so hard, the machining and grinding costs add up quickly when manufacturing precision bearings. All of this must be done in a clean environment with a skilled workforce. Ceramics are incredibly sensitive to impurities in their pores so any contaminates could cause premature failure. As the size increases the price also increases exponentially because of the requirement of high cost processing methods. These include a slower sintering process required to overcome the temperature gradient in the green body, the amount of evenly applied pressure over a larger volume and the resulting machine costs. 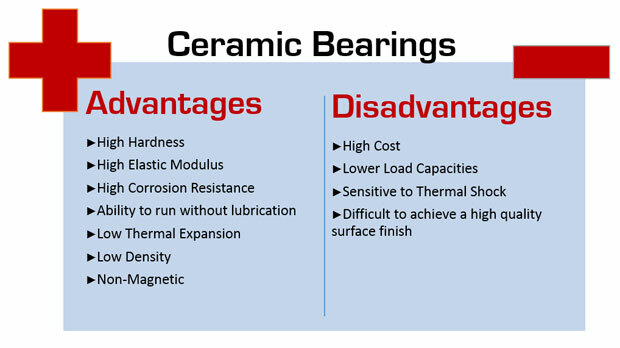 Ceramic bearings have lower load capacities in comparison to metals and are sensitive to thermal shock. Thermal shock is when the temperature gradient within the material causes a differential expansion, which results in an internal stress. This stress can exceed the strength of the material thus forming a crack. Ceramics are also more difficult to achieve a high quality surface finish. It is possible to grind them to a Ra 0.1 surface finish which allows a P5 precision class to be achieved. However, due to recent technological advances, higher precision classes are now possible with Carter ceramic bearings. Silicon Nitride combines the retention of high strength and creep resistance with oxidation resistance. It has better high temperature capabilities than most metals and its low thermal expansion coefficient gives a better thermal shock resistance in comparison with most ceramic materials. Silicon Nitride is black in colour and the material of choice for vacuum and high speed applications. It’s 58% lighter than traditional steel causing a reduction in centripetal force generated by the rolling elements, which significantly increases fatigue life time. Unlike other ceramic materials, Silicon Nitride can hold similar loads to bearing steel; however, it is unsuitable for the race design in any application with shock loading due to the hardness of the material. Zirconia (ZrO2) was developed in the 1960s and ‘70s to produce a thermal barrier on the external tiles of a space shuttle in order to allow the shuttle to re-enter the Earth’s atmosphere without disintegrating. Since then, Zirconia has been the material of choice for high temperature and highly corrosive applications. The density and thermal expansion of Zirconia is more similar to steel than that of any other ceramic material; therefore, it does not have the same weight saving and thermal shock resistance enjoyed by other ceramic materials. However, compared with Silicon Nitride and Silicon Carbide, Zirconia has a high fracture toughness. Zirconia is white in colour. Less frequently used than other ceramic materials due to its raw materials cost and difficulty to machine, Silicon Carbide offers the best heat and corrosion resistance of all the ceramic materials. Silicon Carbide is best used under low loads and in highly corrosive environments. The material properties of these ceramic materials are listed in the tables below along with 440C Stainless Steel for comparison purposes. Many modern materials find their origins in pioneering space technology. Many ceramic materials that are now commonly used in bearings were developed for just this reason. Space exploration exhibits extreme loads and turbulent environments while demanding strict weight constraints and vacuum requirements. Ceramic bearings are able to fulfil these requirements as many of them are lightweight and vacuum compatible. Unlike their steel equivalents, ceramic bearings are able to run unlubricated which not only stops possible contamination of delicate components in the surrounding applications but also reduces weight as there is no need for heavy greases. They also don’t experience cold welding unlike their steel counterparts. Many applications where contamination can be potentially life threatening, ceramic bearings provide the best solutions. Whether it is mixing chemicals or within medical equipment, standard steels succumb to the effect of strong acids and alkalis. Standard steels, including stainless steel, can rust when washed with solutions and result in particulate contamination. Ceramic bearings do not react in the same way as standard steels because they are chemically inert compounds. This means they are not chemically reactive to corrosive materials and will not release harmful by-products. Standard steel bearings also require some form of lubrication, either grease or oil, which can be difficult to clean and eventually breed bacteria unsuitable for sanitary applications. Moreover, as ceramics bearings can run dry and free of additional lubrication, there is no additional microbiology to worry about. Some highly specialized instrumentation may require a fully non-magnetic system. The magneto-optical phenomenon called the Faraday Effect showcases the interaction between light and a magnetic field in a medium. If light is being measured or utilized in an instrument, a standard steel bearing must be avoided. Ceramic bearings are perfect for situations when magnetic resonance is an issue. Ceramic bearings exhibit a vast range of advantages for engineering applications but also have disadvantages that must be taken into consideration. They are extremely hard, corrosion-resistant and have a high elastic modulus. They are able to run without lubrication, have low thermal expansion, are normally low density and have non-magnetic qualities. However, they are expensive, have low load capacities, are sensitive to thermal shock and are difficult to achieve a high quality of surface finish on. 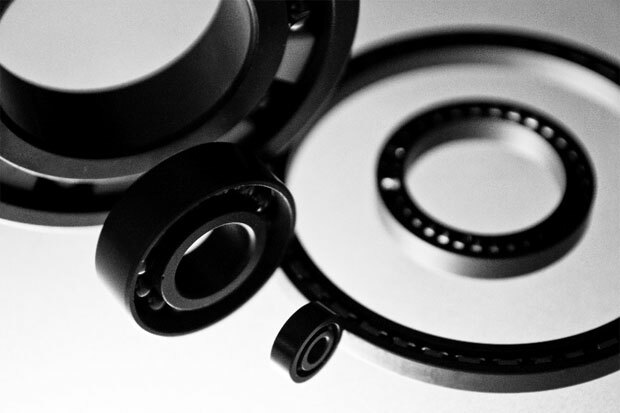 Whether you are using Silicon Nitride, Zirconia or even Silicon Carbide, ceramic bearings are available for a wide range of applications such as space, chemical, medical, and scientific instrumentation. Why Is Stainless Steel Magnetic?